Most carebears won't put an ounce of effort into anything. They don't feel the need to take space (utilizing in-game sov mechanics or otherwise); they rent space. They don't think they should have to work to get highsec ore or ice; they feel entitled to it. They feel isk should flow into their wallets even while they're AFK. They don't think they should be within reach of a keyboard when traveling. But they do put a little effort into trying to capture the moral high ground. When an Agent of the New Order kills a carebear, the carebear balks. He demands an explanation. And yet, it is the Code violator who must justify his illegal behaviour. Agent Tisiphone Dira ganked Dworecki, who was autopiloting in a pod. Tisiphone was indignant. She demanded the gank victim explain himself. Dworecki was stunned to realize he'd been ganked. Until Tisiphone brought it up, he didn't even know it had happened. That's how oblivious the carebear was. Now Dworecki was on the defensive. He had to account for the actions that had led to the loss of his pod. As usual, the carebear was without excuse. He had no good reason to violate the Code. He simply assumed highsec was 100% safe. A good Agent always takes an opening when it's provided. Dworecki asked who I was. Tisiphone recognized it as an invitation. Dworecki got an earful. Tisiphone rejected Dworecki's interpretation of events and provided one based in facts. The fact was that Dworecki screwed up. Now he had to make it right--which turned out to be a simple, four-step process. Tisiphone offered to help, but Dworecki wasn't interested. He knew that even with the Agent's assistance, it would be up to him to do the heavy lifting himself. The carebear softened somewhat, so Tisiphone went right for the sale. Nevertheless, Dworecki wouldn't budge. Then Tisiphone offered a new perspective on the game. 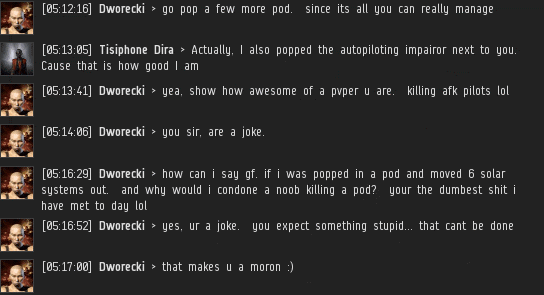 She was fine with getting only the pod kill, because she cared more about her friends than her killboard stats. Dworecki was impressed. He was now one respect point closer to joining the Code-compliant highsec community. Their conversation was further evidence that the more time an EVE player spends with our Agents, the more they tend to respect the Code. Time is always on our side. And in the best ships too! Dingelidongming, go take your sedatives now. Wait, how you type gf in local if you get podded into a distant system? He was podded for not offering a 'gf' after the destruction of his ship, it was said. I am predicting AG is failing, their best forum warrior has gone afk to do "lawyer stuff" and without Veers there just is no more AG. I predicted this!!! eh? I'm still here, bro. The flight in France must be a good Code gank. Wonder if the passengers gave the pilot a gf before they hit the ground. Ugh, carebears. Please stop being disgusting. Maria Malfucker, disgusting for telling the truth about Code? I guess it could be said that for some, it is the mark of a healthy person to be able to be able to distinguish between losing a ship in a video game and a real-life event where 149 real people died. It would appear that the carebear is equating the senseless loss of its mining ship with the senseless loss of 149 real lives. Someone must think quite highly of themselves. It is good thing Code Agents are in the business of adjusting attitudes. But Mingelpingle, you know that person who kill all day in a game have a tendency to take horrible actions in real life too. I bet CCP and Code will buy the silence when they analyze his computer and find EVE client with characters in Code. What is your next target mingelpringle? Where is your next plane crasch? That second pilot trained in a computer simulator just to be able to crash the plane and so do Code, they train in a silly computer game to be able to bully and hurt people in real life. So there is no difference between that horrible suicide and what you do in game, if you can't see that you should stop playing and take your pills. Evidence is shown once again of how disgusting the anti ganker crowd is. Comparing a game to a real life tragedy is an all time low. @Anom 5:19 pleas equate how shooting spaceships in a game about shooting spaceships equates too realize bulling and torture. How is someone being suicide tanked in game hurt anyone IRL??? Also, if you are trying to compare a loss of graphics pixels in a game to a real life terrorist attack where 150 real people were killed you are the one that is in real need of medication. Though I fully expect that any member of CODE may decide to shoot my mining ship at any time, not a single one of them has ever tried to bully me. Not here on minerbumping.com, and not in EVE. There is certainly a difference between their behavior in game vs. out of game, just like there's a difference between a loss of real life or property, and the loss of a game asset. In EVE, you never die. You simply can not be killed. You can combust to bits in a thousand fiery explosions and awaken in a fresh body ready for explosion one thousand and one. That's one of the great things about games. No matter how big your mistake, it's just a game, and no real harm done. You can try all kinds of crazy things, get yourself killed, and at the end of the day, laugh all about it because you suffered no actual loss. The people of CODE want to play a game. They want to do crazy things, and get blown up, and laugh about it, but they see a group of players trying to take that fun away from them by petitioning CCP to make a safe, profitable hisec. That someone mines, or that someone engages in PvE is largely irrelevant, except that it is that kind of player who tends to want a safer, more profitable hisec enough to complain to CCP to change things for them. Many folks want to fight CODE, myself included, but so few of us try to understand the enemy or give any thought to their position. Making fun of Maria and Ming doesn't do anything but make us look bad. Denying facts that are right in front of our face (those CCP slides) makes us look bad. Comparing the loss of our in game assets to tragic loss of real lives makes us look bad. I don't like the pattern I'm seeing. There are a number of ways to fight CODE and look good doing it. You don't even need military might to get the job done. It's late, and I'm tired, but I'll give you an example: The next time you see a new guy mining his brains out trying to afford a ship he really wants, use some of your vast riches to get him a ship. Now you have a friend with guns. Now you have a player with a positive impression of PvE players, like yourself. Be kind, helpful, and supportive, and you'll get your money's worth when the chips are down and you need some muscle. It doesn't work every time, I suppose, but it works for me almost all the time, and that's a pretty low risk investment with huge dividends. Thank you, Star. While I doubt that you'll change the minds or improve the behavior of any of our other regular commenters, it's good to see a rebel who isn't frothing at the mouth or trying to pretend we're real-life murderers and Nazis. Stay classy, Star; you're pretty much the only classy miner we've ever seen around here. @Maria Malukker and every other code member . i assure you there are many more people in eve who want to blow you out of space in game, yet wish you nothing but peace ,joy and happiness in the real world......i am one such person. Here's hoping you're right, Anon@12:04. Most of what we see from rebels though, both in and out of game, is much closer to PoopAnon and M than to you or Star. As much as we all might wish things were different, it is they who are the face of carebears in EvE. Maria Malfucker, but you are real life murderers, you just don't want to accept that. You love to have other players to get angry and that's your true nature. PoopAnon is literally a walking time bomb. Whenever he gets angry, people die. That's just how it is in his world. Mining. Full of people that would rather cut your face sideways as soon as look atcha. People who crash or accuse you of crashing a plane full of people, just because you made them angry. These people are sending a message: "I will answer to nobody!" It is this kind of attitude that the New Order seeks to soothe, through the Code. It, "helps restrict" player behaviours that lead to these kinds of threats, by forcing the carebear to lose money every time it does them. It is an attitude of chill compliance that we are attempting to instill in the carebear, which is the vital attitude required for living and operating inside a large nullsec alliance. In such places, you are not the boss, and you generally do not get a say until you have proven yourself "useful." The Code, while elaborate in its beauty, also serves as the first rung of the ladder of really "making it" in Eve, providing that necessary quality to "be compliant" to a budding PvPEr. From Compliance comes discipline, diction, distinction, and dependability, the lack of which which we can see displayed in PoopAnon, M, Veers, and Held respectively. Fortunately the Code is easy to learn! All you have to do is find a New Order Agent and give them 10 million isk, they will write you a permit, you copy paste that into your bio, and then after that, take 10 more mil, fit up some frigates and try to go kill something somewhere, while never doing PVE again. This is the kind of individual we hope to produce through the Code. ... You still don't get it do you? >.> You propose to hate code. So what have you done in game to stop us? Anything? Comparing ingame actions to RL murder is just crazy talk. I'll let you in on a little secret so listen up this is important. If you want people to follow you in your crusade against code. you need more then forum trolling, personal attacks, asinine comparisons, and a killboard devoid of any kills. Otherwise no one here or in-game is going to take you seriously. Seriously? If code is supposedly sociopaths for playing a game as intended, what kind of monster are you Mr. Anom to make a statement like this. Anon 7:01, your too stupid to communicate in any meaningful way. Please shut up. Anon 7:01 is just another Veers shitpost. He tries to hide behind the anon tag, but what he dont understand is that everyone, even the AG crowd, can see right through it. Not hard to spot him. What a maroon! I would like to thank you for your assistance on the week of christmas of 2014. Your donation to help me with 200 million isk went to rebuilding my lost ships, which i lost at the hands of code gankers. I have also descided to follow your suggestion of paying it forward and found two other people who code ganked and have given them each 50 million isk, and plan to continue to do so. Thank you again mr M.
Let it go, M. Just let it go. Mr Din Ming Tso thinks he is so good and still he is a low life form hunting for rage of other people. Uhuh. And this imaginary person just happens to be thanking M here, on minerbumping, instead of in-game. They just happen to know which in-game character this M guy corresponds to. And they just happen to be posting about their donation now, despite supposedly having been helped 4 months ago. Yyyyyyyup. Hi maria and mingy, sorry to disapoint you both but unlike you both i try to help people. Sorry if you get jelous that people actully like me in game, again unlike you both. To clarify, when i donate isk to help someone, while i use an alt i send them a mail saying the donation is from -=M=-, this is how they know who sent it. Even they dont know who my main toon is, just that he is refered to as -=M=-. To elsa: Im glad to have helped you :) Good to hear your doing better and if you need more help you can contact me again on my alt, im always willing to help friends (something code does not understand). Suuuuure, M. I totally and completely believe that this is a thing you actually do. It's not like you felt stung that we made fun of you over your "no u guise i totally gib moneys 2 minerz, also itz a scam 2 gib moneys". Nope. And it's completely believable that even though you only started reading minerbumping a month ago, you've actually been actively giving money to rebel carebears since the first day that James started bumping miners. I am completely convinced that this is a real thing you actually did. Hey, quick change of topic, sure you don't want to tell us again about how Ming donating money was him being scammed? You know, in between trying to convince us that you've been donating more money than him. And who belive Mingelingdingdong and his fake donation that he claims to be API verifiable. But Mingelingdingdong don't dare to show proof of the donation from meaning it's fake. You know, you've never answered me FakeAnon. Do you think that all minerbumping donations are faked, then? Do you think they're all real, but only Ming's was faked? How do do you determine which were faked, and which are real? Trying to map out the extents of your paranoia regarding faked donations. Please, try to answer this time. Wow, maria you seem to really be hurting that i help people unlike you. It will be ok maria, maybe someday when james pulls all the isk from code and your crying, i might maybe just help you some, maybe. Maria Malfucker, if someone claims his donation is API verifiable and then refuse to provide proof it's clearly fake. All donations that is not verifiable from API are fake. Why should anyone trust something that is not verifiable by a third party? I should be able to take your so called proof and have a third party to verify that. Today no Code player have been able to supply that kind of proof. You misunderstand me, M. I'd be glad if I believed that you actually gave money in support of a cause you believe in. It'd make you somewhat less execrable in my eyes. But I also understand fairly well at this point how carebears think, and how you think; there's literally no reason for you to have actually given money to other people, when you could just come on here anonymously and say you've done so while having held on to your money. Either way you'd feel that you'd achieved your goal (showing up those mean ol' New Order Agents), and since none of it is verifiable anyway, by lying you get to keep the money you need to PLEX, or buy new ships, or whatever. You've made your ideals and morals pretty clear in your time here, M. You're here on minerbumping with the goal of hurting the people who you feel hurt you in-game; that's your goal, and since you believe you're the injured party, any tactic is acceptable in pursuit of that goal. So what would stop you from lying to us, since you believe we're liars? What would stop you from trying to bait and grief us, since you believe we're all griefers? You did not, and never would, part with money to help other people. And that sad reality is what "hurts" me, M.
"I honestly could not care less if you believe me or not." ....said the guy who haunts our comments sections and makes posts under other names to convince us of his donations. Sure thing, M. Glad to hear you devote so much of your time to something you don't care about. If you'd like to pay Chribba 100m to verify my donation for you, feel free to have him send me an eve mail. Wow, sucky pvp record. Guess thats why maria posts more then she flies. How about you post your kill board and lets see if it's any better. I don't know how to interpret the top statistic, but it seems she's inflicted 10B in damage while taking only 7B, financially, and has dealt over twice the amount of raw damage that she took. Isn't that doing pretty well? Or is there something I'm missing? Mingelingadingdongbigfatliar, so it's true that you never donated at all. You are to scared of giving the proof you say you have that can proove your fake donation. On the second place you are one good candidate to crash the next flight, so what's your target? Oh hai, Anon@12:57! It's heartwarming to see you anons doing a bit of legwork, and finally making some use of the Eve meta. I'm a little unclear on what you were hoping to achieve by referencing my killboard though; I'm happy to admit that I'm an awful combat pilot. There's a reason why I'm only an Agent of the New Order, and not one of its noble Knights. Though to be fair, my preferred combat role is logi, and those tend not to show up on killboards. He's pretty adorable, hope he sticks around for a while.